The VCReporter is in search of notable people in the community who give their time and energy, philanthropy as well — the charitable people who work to improve our communities without getting anything in return. They would like to honor those individuals as best they can, but they need to find them first. The nominations are due by June 15! 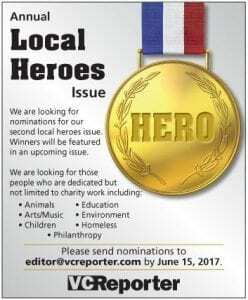 Email your nominations to editor@vcreporter.com. Last year’s recipients include youth advocate Nancy Mayerson, a longtime volunteer at the Boys & Girls Clubs of Greater Oxnard and Port Hueneme; arts/veteran advocate Michael J. Arndt, a professor of theater arts at California Lutheran University; animal advocate Janis Shinkawa, medical director and founding partner of Ohana Pet Hospital in Ventura; Brittany Groot, board member of Access TLC Hospice Foundation; and environment advocate Kitty Merrill, who started the local chapter of 350.org, also known as the Ventura County Climate Hub. Read more about the accomplishments of these local heroes and others at the VCReporter website. If you know someone who you think is a hero, be sure to send in your nomination by Thursday, June 15!